I graduated from Emory University with a BS in Biology. I was first licensed in 1972 as WN9IUJ. I upgraded soon thereafter to WB9IUJ while working in South Bend, Indiana as a process chemist at Uniroyal Corp. The winters were too cold for someone raised in Georgia so I moved back home and changed my call to WB4DHO. About 1978 I upgraded to extra and was issued my current call sign- N4HU. In 1978 my working career took a change of course and I spent 38 years operating Georgia Precision Machine which supplied metal working machinery and equipment to industrial manufacturers across the state. 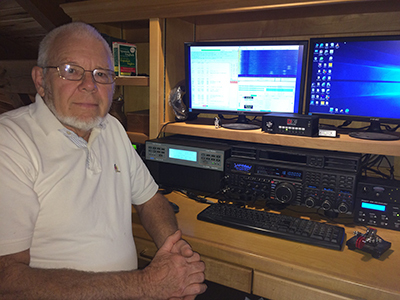 Dxing has been my passion since I was first introduced to ham radio. There have been a few short years that I had to put ham radio on hold but during my active years have been able to earn 9 band DXCC with 346 countries confirmed. I am a long time member of the Southeastern DX Club and also a member of the Northern California DX Foundation. My other passions include farming-with horses- whenever possible and spending time with my 2 grandsons. My wife and I live on a working farm and enjoy all that goes with farm life. I am excited about the opportunity to visit KH1 with the team and the prospects of being on the other side of the pileup .